This is an institute where the Thirty-Six Doctors of the Catholic Church teach the Liberal Arts. Key figures and texts will be studied beginning in Ancient Greece and finishing in the Modern Day. Master Tutors lead the students in a Socratic methodology that allows for a dialogical approach to education in order to form critical thinkers in each of the students. The Holy Doctors will help the students to understand the unity that can be found in faith and reason. 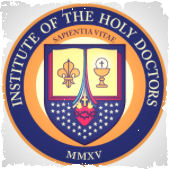 The Curriculum at the Institute of the Holy Doctors has been formed around six tracks of study: Writings of the Doctors, Ecclesiology and Magisterial Documents, History and Science, Literature and the Arts, Theology and Philosophy, and Practical Apologetics. The four-year academic program is broken down into four main themes. The first year focuses on How to Know, the second year on How to Understand, the third year on Wisdom, and the fourth year on Piety and Fear of the Lord. In addition to these the apologetics course focuses on Counsel and the formation at IHD on Fortitude. These focus areas mirror the seven gifts of the Holy Spirit. Each of these tracks and themes are both vertically and horizontally integrated such that what the student learns in each track is supported and enhanced by each of the other tracks; resulting in an emersion that allows the student to follow the threads of truth through multiple disciplines and thus develop a very deep and broad ability to think, all informed by teachings of the Holy Doctors and supported by spiritual formation. The Writings of the Doctors track guides the students to think with the mind of the Church. The Holy Catholic Church has designated certain Saints as “Doctors of the Church” granting them the unique role as “sure guides of the faith” applicable for any time and place and person. These “Doctors” then can be said to think with the mind of the Church and as such, when studied, can be said to have formed the student in thinking with the mind of the Church. Select readings from the Holy Doctors will be read in all courses as a constant reminder and reference of the thoughts of these particular Saints of the Church and their applicability to all aspects of life. The Ecclesiology and Magisterial Documents track, complements the Writings of the Doctors Track as it continues the formation of the student in what the Church says of herself. The base text is the Catechism of the Catholic Church. By studying this document the student hears from the Church Herself about what she believes and what it means to be Catholic and think with the mind of the Church. The History and Scientific Achievement track exposes the students to the natural world and the acts of humans in the context of history. This track draws the student to examine the good and the true, as is found in the struggle of man with respect to his neighbor (history) and in his struggle to understand the created world (science and mathematics). The Literature and the Arts track leads the student to examine their understanding of the nature of man and his own weakness apart from an objective good (God). This track allows the student to draw out of literature and art, the good, the beautiful and the true. Works of Literature and Art are man’s public acknowledgement of his incapability to solve the problem of sin. This realization makes its way into the world in the form of artistic expression in which man attempts to fill the void created by sin by revealing the dignity for which he is created. In the Theology and Philosophy track the student encounters Christ the Lord. The Incarnation is the solution to the problem of man. This study will allow the student to come to understand the beauty of God’s solution: Namely, Salvation, God’s plan of redemption and how to fulfill his mandate: The Great Commission. ​The Faith & Reason track helps the student to take all that they have learned about “thinking with the mind of the Church” and cultivating the “Good, the Beautiful, and the True” and communicate those truths to the world around them. The students who Encountered Christ the Lord now bring that encounter to the hurting world around them through the medium of literature, economics, suffering, and life ethics.